On the surface, A Wrinkle in Time seems standard Disney fare: a family film with a predictable happy ending. But director Ava DuVernay has done much more with the source material, and the result is a beautiful work full of hope and aspirations. Based on the 1962 novel of the same name, by Madeline L’Engle, and scripted by Frozen’s Jennifer Lee and Bridge to Terabithia’s Jeff Stockwell, the story follows Meg Murry (Storm Reid) and her little brother, Charles Wallace (Deric McCabe), who go off in search of their scientist father (Chris Pine). He’s been missing for four years, after using a tesseract – untested space/time folding technology, which he and his fellow scientist wife (Gugu Mbantha-Raw) discovered – and it made him spontaneously disappear to another world inhabited by a mysterious, evil force called The It (David Oyelowo). Joined by Meg’s classmate Calvin O’Keefe (Levi Miller), and guided by three magical astral travellers known as Mrs. Whatsit (Reese Witherspoon), Mrs. Who (Mindy Kaling) and Mrs. 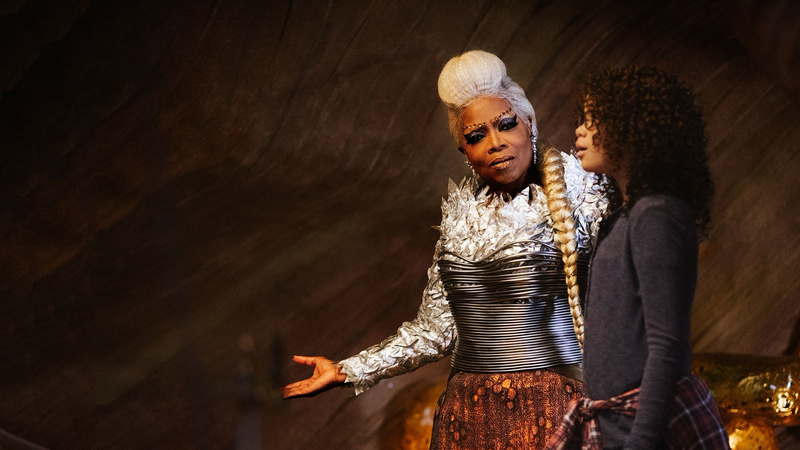 Which (Oprah Winfrey), the children brave a dangerous journey to fantastical worlds, in the hope of finding Mr. Murry, and along the way, they face many challenges. The book is somewhat of a classic for American children, but not at all part of UK school reading. This perhaps makes difficulty in judging how accomplished an adaptation it is. As a kids’ film, though, it definitely offers a sense of wonder and adventure, wonderful performances from the cast, and excellent jeopardy and suspense; as an adult watching, I found myself to be surprisingly moved, close to tears a few times, which made me less affected by the awkward CGI and the occasional weak plot point. What the film does extremely well is explore themes which will positively impact those watching, particularly young girls of colour. For starters, the Murrys are a mixed race couple who are very much in love, and whilst this is rare to see in a mainstream Disney film, it’s even rarer indeed to have a husband who is white and a wife who is black. This positive representation exists in the story as proper onscreen inclusion should: something seen as normal and not just lip service. A theme throughout the film is self-esteem, or to be more exact: a lack of it. Meg clearly has suffered from the disappearance of her father, dropping out of school for the most part, and losing any confidence she had. It’s a story many kids can relate to: feeling lost and unhappy, and lacking self-worth. Meg dislikes who she is, feeling that she’s unworthy of happiness; indeed, the weight of her sadness and insecurity actually make it difficult for her to move through the universe when ‘tessering’, whereas Charles Wallace and Calvin are able to dimension-hop with ease. Another issue explored is how self-hatred can often translate into worries about appearance, particularly for girls. When Calvin tells Meg “You have great hair”, she responds “What? No, I don’t”. This is subtly highlighting the experience of a young woman of colour, wearing her hair in a natural style, because this discomfort has roots in her experience of racism, as well as growing up female in a world which judges women on appearance. This particular dialogue between Meg and Calvin is repeated a few times in the film, and later functions as a callback: when we meet an evil version of Meg, she has no glasses and she has chemically straightened hair. The message is clear: the real you is good; self acceptance means being strong and brave and authentically you, and no need to feel shame. This self-doubt which young people experience is explored deftly by DuVernay, and offering them an empowering vision of who they can be, means this film will have a great impact on those watching it. In many ways, this is a love letter to young people, a message that incredible things can happen, that people can create magic and be in love and change the world, when self-loathing is replaced by self-love. By showing that self-worth and acceptance of one’s faults are to be valued, DuVernay has shown how empowerment can come from changing your own outlook, and perhaps adults as well as kids will be able to take something positive from this movie.